Lebanon Valley looks to bounce back after a 35-0 loss at No. 5 Delaware Valley last week. LVC will try to avenge a slim 27-24 loss at Lycoming a year ago. The last six meeting between Lebanon Valley and the Warriors have been decided by one score or less. The Dutchmen have recovered 15 fumbles on the season; a number that ranks first in the MAC. Saturday's home finale will also serve as the football program's Senior Day. LVC will honor its 25-member Class of 2018 before the game. Saturday's game is the 33rd meeting all-time ... Lycoming leads the series 26-6, winning the first 21 games to begin the series, but LVC has won five of the last 10 ... The first meeting was on Nov. 19, 1955, a 25-7 Lycoming win ... The two teams played in 1956, then did not play again until 1985 ... Lyco earned a narrow 27-24 win in Williamsport last fall ... 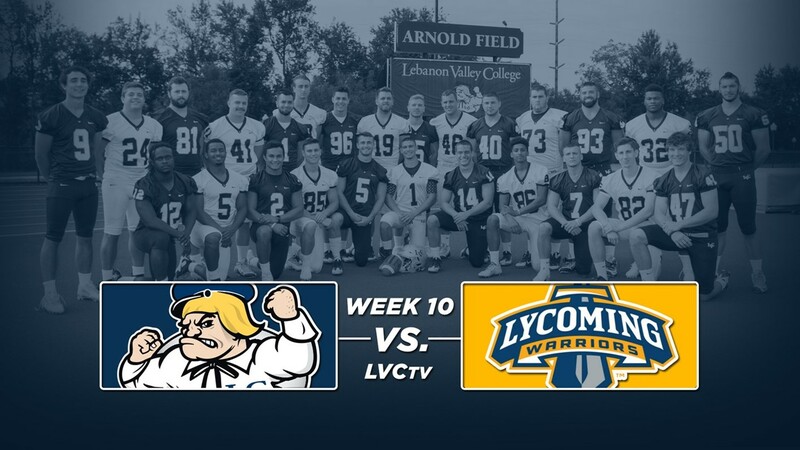 The last Dutchmen victory came in a 41-38 overtime thriller against at Arnold Field in 2015 ... Not since LVC's 28-14 victory in 2010 has a game been decided by more than one possession ... Two of the last three meetings have gone to overtime ... LVC's 14-7 win over Lycoming in Annville in 2013 was the program's first over a nationally-ranked team. LVC erased a 21-point first-half deficit and claimed the lead late in the fourth quarter but couldn't hold the advantage down the stretch in the team's heartbreaking 27-24 loss at Lycoming last fall. With 6:09 left to play, LVC recovered a fumble caused by Kyle Murray at the Lycoming 22-yard line. Four plays later, Tyler Sterner connected with Michael Gaval for the go-ahead touchdown from nine yards out, giving LVC its first lead of the day at 24-21 with 4:37 remaining. The Warriors avoided their the loss by driving 75 yards in nine plays on the ensuing possession, capped by a 34-yard touchdown pass from Chase Whiteman to Nick Costello with 1:25 left to play. Devon Flynn's extra-point attempt was no good, giving the Flying Dutchmen a chance to get into field goal range in the closing moments. Sterner completed three passes on Lebanon Valley's next drive and moved the Dutchmen to Lycoming's 41-yard line with 26 seconds remaining. Facing a fourth and six, Sterner was picked off by Joe Pinzka at the 23-yard line on what proved to be LVC's final offensive play, ending what was a relentless second-half comeback effort. With the Dutchmen trailing 21-14, Marcus Brown converted a 28-yard field goal at the 12:05 mark of the fourth quarter off the hold of Dallas Arner to cut the deficit to four and cap an impressive 17-play, 69-yard drive that ate up over seven minutes of clock. LVC made it a one-possession game midway through the third quarter when Sterner hit Gaval for one of the team's longest passing touchdowns of the season; a 30-yarder that finished off a seven-play, 47-yard drive and drew the Dutchmen to within 21-14 at the 7:11 mark. Facing a 21-0 hole as the second quarter wound down, Lebanon Valley made a statement by driving 59 yards in 11 plays. A Brendon Irving 16-yard rush keyed the drive and fellow backfield mate Jon Jones capped it with a four-yard touchdown run with 28 seconds remaining before halftime. A Tim Pirroneinterception led to Lycoming's third touchdown of the first half as Bowman burst for a 57-yard run to paydirt on the Warriors' first play of the ensuing drive to make it 21-0 with 9:21 left in the second quarter. Lyco got on the board first when the home team finished off its second possession of the game with a nine-yard touchdown pass from Whiteman to Costello with 6:09 remaining in the first quarter before the Warriors doubled their advantage with an 11-play, 56-yard drive that ended when Keeghan Morrison caught a 12-yard touchdown pass from Collin Wright early in the second quarter. Lebanon Valley ran into a juggernaut in one of the best teams in the nation this weekend. No. 5 Delaware Valley showed why it's an NCAA Division III national-championship contender in a 35-0 MAC victory at James Work Memorial Stadium on Saturday afternoon, Oct. 28. The undefeated Aggies flexed their muscle right out of the gate when tailback Devauntay Ellis broke off a 55-yard touchdown run on DVU's opening drive to put the home team out in front 7-0 less than three minutes into the game. The Dutchmen flashed their defensive prowess when safety Zachary Adams halted Delaware Valley's next drive by picking off quarterback Dashawn Darden at the LVC 17-yard line and returning it 20 yards. The story of the game, however, was LVC's inability to move the ball against the Aggies' defense. The Dutchmen were unable to pick up a first down in the first half after four three-and-outs and totaled just six yards of total offense. DVU on the other hand, had little trouble amassing points, adding a second touchdown on the second play of the second quarter to double its advantage. The Aggies' next possession also wrapped up in the end zone, this time after 10 plays and a 46-yard march. The backbreaker for LVC came when quarterback Tyler Sternerthrew an interception on the first play of a drive that began at the team's own 38-yard line with 3:11 left in the second quarter. Del Val moved 43 yards in five plays and Ellis added another touchdown run, this one from five yards out, to cushion the advantage heading into the break. Lebanon Valley's best drive came midway through the third quarter but failed to net any points when the Dutchmen were stopped on fourth-and-1 at Delaware Valley's 43-yard line. Darden completed an 18-yard touchdown pass to Dan Allen with 13:19 left in the fourth quarter to cap the scoring, while the DVU defense kept LVC's offense from reaching the red zone the rest of the way to put a bow on the shutout victory. Prior to Saturday's home finale, Lebanon Valley will honor its 25 senior players comprising the LVC Football Class of 2018. As a unit, the group has racked up 16 victories, with fullback Evan Lysczek, tight end Dylan Berberick, cornerback Spencer Moser, and linebacker Alex Trujillo having earned MAC All-Conference honors at some point during their career. Cale Bruso, Tim Pirrone, Jeremy De La Cruz, Mike Gilger, Blake Lutz, Ja'von Nelson, Tim Schumacher, Cody Davis, Tyler Cottle, Tyler Sterner, Paxson Hayes, Jon Jones, Tom Gallagher, Nick Newton, Guy Zimmerman, Bob Van Horn, Jordan Spahr, Colt Baxter, Steven Salcedo, Tyler Conlon, and Tommy Garner join the foursome as soon-to-be graduates. Last year, the class became the first to defeat Albright, march to Kreiderheim, and earn an extra day off of classes since 2011. If you're thinking about trying to beat the traffic, you may want to think twice. The last six meetings between Lebanon Valley and Lycoming have been decided by one score or less. Last season, The Warriors held on for a 27-24 victory after LVC came away with a 41-38 overtime win in 2015. Prior to that, Lyco edged the Dutchmen 30-29 in OT in 2014 and Lebanon Valley went over a ranked Warriors team 14-17 in 2013. On average, the last six contests have been decided by 4.2 points. Thanks to a 4-3 record in conference play and an all-important, midseason victory over Stevenson, Lebanon Valley finds itself in the thick of the playoff hunt with just two games left in the regular season. Following a successful introduction in 2015, the MAC and Centennial Conference have announced the return of the Centennial-MAC Bowl Series for the third postseason in a row. The bowl games will take place on Saturday, Nov. 18 at locations to be determined following the final weekend of the regular season. The bowl games will pit the top two teams from each conference that are not selected to the NCAA Division III Championship against each other. The top team from each conference that is not selected to the NCAA Championship will host the second best team from the opposing conference not moving on to NCAAs in one game of the series. The Dutchmen currently sit fourth in the MAC standings. A pair of victories to end the season would give the team a legitimate shot at its first postseason appearance since winning the MAC Championship in 2013. The area in which the Dutchmen have most excelled to this point in the season has been the kick return game. As a whole, LVC leads the MAC with an average of 22.5 yards per kick return. Jeremy De La Cruz's 24.6 yards-per-return clip is good enough to rank him second in the conference, while fellow return man Tyeair Diggs also ranks top-three in the league with a 22.7 yards-per-return average. De La Cruz's longest return on the year is 43 yards, while Diggs' top effort is a 35-yard return. On the other side of that coin, Lycoming's kick coverage team is the best unit in the MAC at present. Something will have to give on Saturday afternoon. LVC currently ranks third in the MAC with 10 total picks on the season. Linebackers Tim Schumacher and Tyler Lutz have each pulled in a pair of interceptions this fall, while safety Anthony Jenkins has also recorded two picks so far this year. Defensive backs Nick Tucker, Blake Lutz, Mike Gilger, and Zachary Adamsall have one interception apiece this season. Lebanon Valley has forced and recovered four fumbles in a game on two occasions so far this season. That number is the most of any team in a single contest in the conference this year. The Dutchmen came away with four fumbles during their Homecoming victory over Stevenson, as well as against King's in September. LVC also recovered three loose balls in a shutout victory over Wilkes on Sept. 9. For the year, the Dutchmen have come away with 15 total fumbles. Lebanon Valley is averaging 282.6 yards of total offense per contest, with 156.1 of them coming on the ground and 126.5 of them coming in the passing game. The run game has featured a number of backs getting significant time, with Jon Jones leading the way with 310 yards and three touchdowns. Hunter Wilson's role has expanded as of late and the freshman has rushed for 129 yards in five outings. Quarterback Tyler Sterner is completing 47.9 percent of his attempts. He's thrown for 940 yards and eight touchdowns. Tim Pirrone is the team's leading wide receiver, with 242 yards and three TDs, while wideout Jeremy De La Cruz has racked up 241 receiving yards and four touchdowns. This fall, the Dutchmen have lost seven fumbles and thrown four picks. The Dutchmen are surrendering 24.1 points per game, as well as 348.9 yards of total offense to the opposition. LVC is allowing 214.3 yards through the air per outing, while giving up 134.6 yards on the ground per game. Linebacker Tim Schumacher's 42 tackles leads the team, while fellow linebackers Tom Gallagher, Tommy Garner, Tyler Lutz, and Tyler Hodges have all made 30-plus stops. Defensive lineman Guy Zimmerman's three sacks are tops among Dutchmen, while Zimmerman, defensive end Austin Maguire, Garner, and Hodges have all made at least three TFL. LVC has forced 15 fumbles, with Schumacher responsible for three of them, while Schumacher, Lutz, and safety Anthony Jenkins lead the team with two interceptions each. This fall, LVC has forced 25 turnovers to record an outstanding plus-14 TO differential. The Dutchmen have the top kick return unit in the MAC, as Jeremy De La Cruz and Tyeair Diggs are both averaging more than 22 yards per return. Tim Schumacher has also been solid on punt returns, averaging more than 10 yards per attempt so far this season. Tyler Hodges has the team's most recent punt block, while Jacob Whitfield recorded a block of an extra-point attempt in the season opener against Franklin & Marshall. Adam Domovichhas settled nicely into the role of punter, averaging more than 35 yards per attempt on 38 total kicks, including 11 that have been downed inside the opponent's 20-yard line. Marcus Brown is 8-11 on field goal attempts so far this season, with his longest make coming from 37 yards out. Nick Bentz has looked very good on kickoff attempts, as he's averaging more than 60 yards per kick, with nine of his attempts resulting in touchbacks. Lycoming is putting up nearly 26 points and 308 yards per game. Quarterback Chase Williams has thrown for 1,099 yards and eight touchdowns to go along with just three interceptions so far this fall. He is completing more than 53 percent of his passes. Running back Sam Dressler is the team's leading rusher with 365 yards and three scores on the ground. Wide receiver Nick Costello is the team's top pass catcher, pulling in 32 receptions for 431 yards and five touchdowns. Defensive back Mike Ward leads the team with 64 tackles, while defensive lineman Sam Romanofsky leads the way with six sacks for the Warriors. Lyco is currently even in the turnover department. The Dutchmen wrap up their regular season when they travel to take on longtime rival Albright on Saturday afternoon, Nov. 11.